John Randolph LeBlanc is professor of political science at the University of Texas at Tyler, where he teaches political theory and legal philosophy. He is author of several books, including Edward Said on the Prospects of Peace in Palestine and Israel (Palgrave Macmillan, 2013). He has co-authored a book with Carolyn Jones Medine, Ancient and Modern Religion and Politics: Negotiating Transitive Spaces and Hybrid Identities (Palgrave Macmillan, 2012), and has published in journals. Carolyn Jones Medine is professor in the religion department and in the Institute for African American Studies at the University of Georgia, where she is also affiliate faculty in the women’s studies program. Her research interests are in Southern American literature and religion, focusing on postmodern and postcolonial theory. She is co-author with Theodore Trost of Teaching African American Religions (Oxford University Press, 2005). The confrontation between Israel and the native population of Palestine is an instance of a democratic population generating its “other” through practices of dispossession and displacement. The dispossessions are clear to see, but the displacements—physical, spiritual, political, ethical—are more subtle and have all but foreclosed the possibility of recognition between the two communities, particularly the identification of one’s self in one’s other that would seem prerequisite to a functional politics.1 One significant displacement has been shifting the consequences of the history of Jewish suffering onto the non-Jewish population of Palestine. Rather than a recognition of two human populations with histories of suffering, the encounter is moved from the general ground of shared humanity to the more particularized ground of identity, where one population has a decided advantage due to its power and given the current state of geo-political dynamics. This move allows the well-established Jewish identity to move aside Palestinians, whose identity presumably must be proven in spite of their presence. While in the short term the move to identity cements the power differential between the two communities, the shift has implications for members of both, and for the possibilities of any kind of humane politics. The Palestinian experience of occupation necessarily drives Palestinians to their own interiors, physically and psychically, away from possible engagement with Israelis, even those sympathetic to their plight. In After the Last Sky, Edward Said’s text that accompanies photographs by Jean Mohr, the writer offers an impressionistic chronicle of what it means to be Palestinian by examining the effects of occupation on the everyday lives of Palestinians. In this work, we see the deconstructed community resist its consignment to non-existence by reconstructing itself, not in terms of identity, but rather in terms of presence. Mohr’s and Said’s Palestinians resist by simply being in place; theirs is the simple but undeniable presence of people living their lives under constant threat of disruption or dispossession. The consequence of this thwarting is that Palestinians are forced to define themselves in ways that other groups have not been asked to do, rendering them vulnerable to erasure—discursively and physically.7 To overcome this kind of erasure, Said offers After the Last Sky, in which he creates a text, accompanied by photographs, which together function to make real a people whom others want to disappear with “no remains.” The text is both multi-vocal—containing Said’s voice and that of others he is careful to preserve—and inter-textual—as word and photograph overlay like transparencies transforming genre. As such, the text is an invitation to the reader and viewer both to listen to (the word) and to construct (the images’) meaning. The photograph, Barthes argues, creates an encounter, not mere memory. Indeed, a photograph may interrupt the ways we want to remember, may block memory, and may “quickly [become] counter-memory.”17 It has the capacity to interrupt and suspend narrative flow and the movement of time towards any teleology. It can also endure after a telos has been reached, that is, after death. To be sure, we can resist this power.18 Barthes recognizes that we can throw photographs away or just consume them banally: “Such are the two ways of the Photograph. The choice is mine: to subject its spectacle to the civilized code of perfect illusions, or to confront in it the wakening of intractable reality.”19 The latter is what Said hopes we will do in viewing the photographs in After the Last Sky. Presence, however, carries its own weight, a counter-weight to the absence of “identity.” Said, in discussing a series of photographs of Palestinian shepherds and women in the fields, notes that those images “seem saturated with a kind of inert being that outweighs anything they express; consequently, they invite the embroidery of explanatory words.”33 Mohr’s photographic representations, Said argues, are “the culmination of a sequence of capturings”34 in which what is captured is the work of life and survival—a father and child at a medical clinic, men working on combustion engines, women tending to children, and scenes of households or working in the fields. Therefore, Mohr’s photographs are not staged in the usual sense, but rather are demonstrations of the degree to which the photographer really does not control that which he captures. The lives of the subjects are responses to conditions generated by others, so the staging comes from outside forces generating lives of what Judith Butler calls “precarity” under occupation.35 The series of photographs of Palestinian peasants working reveal them, Said argues, to be “the creatures of half a dozen other processes, none of which leaves these productive human beings with their labor intact.”36 It is their unselfconscious response to these conditions, the assertion of “inert being,” that is the site of Palestinian identity, and that gives this identity a universal character. If Palestinian presence cannot be articulated in the usual narrative frame, as a linear progression, telling the story of the development of a people’s culture over time, its discontinuity, owing largely to uninvited outside influences, must nonetheless be adapted to on the inside. The Palestinian story necessarily lurches from one state of being, from one place of being, to the next, certain only of what is close-at-hand and, correspondingly, of both its solidity and its impermanence. 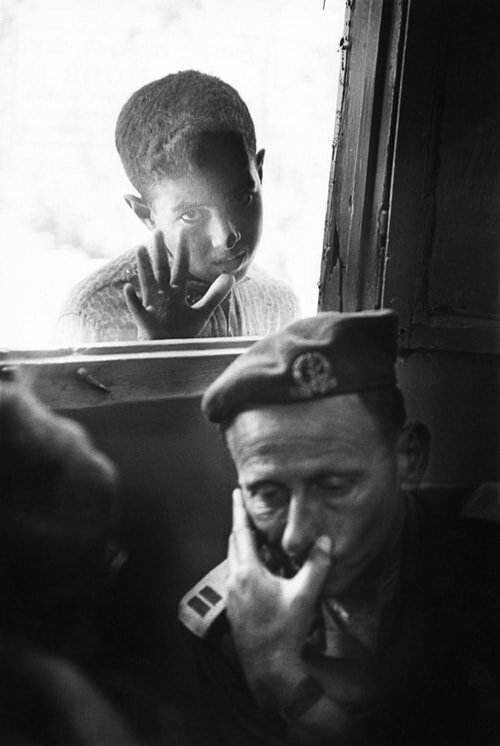 Jean Mohr, A few days after the Six-Day War, an Israeli officer considers a proposal, under the gaze of a Palestinian boy. 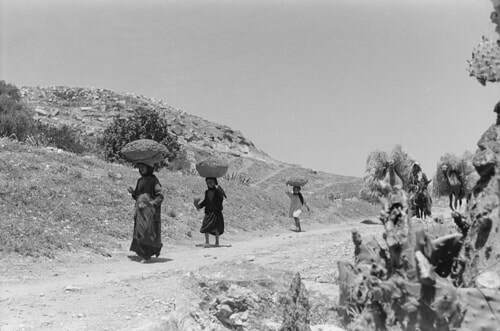 Kalandia village between Jerusalem and Ramallah, 1967. ©ICRC/MOHR, Jean. The obduracy Said identifies in the Palestinian experience draws Palestinians to their interiors, seeking shelter if not safety, meaning if not permanence. Yet the text and photographs of After the Last Sky give voice to an unwillingness to stay inside, an unwillingness to fold beneath the pressure of the representations and expectations of their others. The little girl and the little boy in the photographs make a claim on the viewer but also on their environments, and they do so from the fragile certainty of their own presences. This desire to claim self-representation is what Said emphasizes in his reading of Mohr’s photographs. It is that capacity for self-representation that puts to the lie claims about Palestinian “unfitness” for the emergence of a democratic ethos—beyond institutions and processes. But institutions and processes cannot overcome the lack of sovereignty over territory, over movement, over life in general. Said knew—and his later, especially post-Oslo work bore this out—that what permanence there was to be had in Palestinian existence was not to be found in Hamas or the Palestinian Authority or the Israelis or the Americans. It was, rather, a function of what Raja Shehadeh termed sumud, steadfastness, that is, the willingness to stay and to live. Engaging in any kind of humane politics (democratic or otherwise), that is, a politics oriented to human being rather than more narrow partisan or other interests, required transcending these critical but minimal objectives. But such transcendence is no guarantee. The people in Said and Mohr’s work are deeply located, and Said’s text and Mohr’s photographs take us through a thick description of the worlds they inhabit. Said’s work moves from fragmentation to meaning: the photographs are connected by Said’s own story, which becomes witness to a Palestinian story and identity. He moves from the episodic to the diachronic. In both story and photograph, narrative is tied to a conception of identity that would seem to be a prerequisite to collective political existence. We began by reading the conflict in Palestine/Israel as one in which the human had been displaced in the name of an identity narrated and in need of preservation. Where, as in the Palestine/Israel conflict, politics favors identity, it privileges a certain kind of narrative—linear, progressive, established, assumed. The privilege of identity is that it need not be self-reflective. It is whole without such interrogation. But, the want of self-reflection easily slips into denial, not only of self, but also of the particular “other,” even the innocent other, like the children in Mohr’s photographs. Where there is no willingness to interrogate one’s own actions, there is no ground upon which to meet one’s “others”. Without a check on one’s own logic, violence emerges that cannot help but be, ultimately, self-destructive. Narrative is important to a democratic ethos and to religious meaning. Telling one’s story and listening to that of others is an essential part of what it means to be a member of any community of equality. But locking our understanding of the term into one form is, as Iris Young suggested, misleading and dangerous.49 Said reminds us that the battle over land is often “reflected, contested, and even for a time decided in narrative.”50 The work of Said and Mohr, on the other hand, attempts to change the terms of the encounter, resisting being caught in the need for identity and playing the master’s game. The purposes and possibilities in narrating identity have changed. Mohr’s photos and Said’s texts yield a Palestinian narrative that is non-linear, even counter-linear—a call back to an older cyclical notion of time forced upon any people denied a settled place. Such a people must live in a counter-memory, story telling culture, not a historical one. To be sure, being in the position where one has to demand the space for self-representation is to be vulnerable to the kind of ongoing dispossession and displacements that are still the lot of Palestinians in the West Bank some thirty years after After the Last Sky was put together. Yet, the Palestinians in the photographs have no choice but to define their space over and again, daily. The repetition unto destruction that would seem to be the stuff of modernity is countered by the repetition unto obduracy and continuity that we get in the work of Said and Mohr. Nonetheless, there remains in this narrated Palestinian experience a sense of being trapped where someone else has put you. This, too, is the essence of the photograph, as it makes time stand still. Said and Mohr resist this in their multi-vocal, layered narrative. The communities narrated here are each struggling with what it means to be human in their context(s). The power differential between them, the differences in the capacity for agency, does not change the fundamental problem: there can be no functional politics between (or within) communities where the connection between self and other as fellow human beings and possible political partners is not recognized. In the case of Palestine/Israel, it is no longer possible to tell one community’s story without reference to the other. This is the fact that Palestinians have long known and the Israelis are now confronting. In it may well be found the possibility of a future for both communities in this small but significant bit of territory. We are not yet talking about the kind of recognition that the literature usually seeks. Here recognition as fellow human beings is required for there to be a democratic politics. See for example Nancy Fraser, “Rethinking Recognition,” New Left Review 3 (May/June 2000),107-120; and Nancy Fraser, Redistribution or Recognition: A Political-Philosophical Exchange (New York: Verso, 2004). In Edward Said and Jean Mohr, After the Last Sky (New York: Columbia University Press, 1998), as elsewhere, Said’s work assumes that articulating a Palestinian identity in the ordinary way is not feasible. While he uses the term in the text, he clearly means something different by it than the reader would expect. So much about established identities is assumed, implied, already established. In its pedagogical character, the content of identities consists of the stories that people tell themselves about themselves in order to make sense of their shared existence. These narratives harden over time and through experience such that to say one is “Jewish,” for instance, can be done more or less unreflectively while still assuming that the hearer has a point of reference. The utterance plugs into a long history, where extraordinary pain mingles with remarkable accomplishment and resilience. That history, that narrative, gives the utterer a place to be and a space from which to speak. To be forced to articulate such an identity from scratch is a nearly impossible task. “We need to retell our story from scratch every time,” Said writes, “or so we feel. What we are left with when we get to scratch is not very much and memory will not serve” (Said, 75). But rather than conceding to the impossibility of the task, Said (with Mohr’s photographs) changes the terms and even the object of the enterprise. Instead of focusing on establishing an identity per se, that is, a narrative attempting to challenge or even supplant the dominant Jewish one in Palestine, Said focuses on the actual experiences of Palestinians, namely, their presence and the ways in which that presence manifests itself in their everyday lives. David Margolis, “Who Are the Palestinians?” My Jewish Learning. http://www.myjewishlearning.com/article/who-are-the-palestinians (accessed March 1, 2014). The Arabs of Palestine, opponents argue, “never exercised national sovereignty in the country in which they lived.” They were tribal and semi-feudal “occupants of a geographical space, not members of a “nation.” Even at the time of the nakhba, the United Nations called them a “people,” like other peoples, who nonetheless found themselves re-created in the experiments of modernity. Moving from subjects of the Ottoman Empire to citizens of states, they exist only relationally—as “Palestinians with Israeli citizenship”—or as refugees. Alan Godlas, personal communication, 02/05/2014. This vulnerability is readily demonstrated in the aftermath of the massacres at Sabra and Shatila in Lebanon which occasioned Said’s work in After the Last Sky. In the 1982 attacks by Maronite Christians of the Phalange party (duly overseen by the Israeli military) on the camps in Lebanon, many were massacred; others were marched out of the camps and either executed or taken away on trucks, “never to be seen again.” Not only Palestinians and Lebanese were killed, but also workers from Egypt, Syria, and Pakistan. “When asked how many Palestinians had been killed during the massacre, a Phalangist militiaman who took part in it replied, ‘You’ll find out if they ever build a subway in Beirut.’” Leila Shahid, “The Sabra and Shatila Massacres: Eye-Witness Reports,” Journal of Palestine Studies 32:1 (Autumn 2002), 36-58. Roland Barthes, Camera Lucida: Reflections on Photography, Richard Howard, trans. (New York: Macmillan, 1981). Barthes is looking at photographs of his mother, who has died. For Barthes, the photograph creates an identification of reality (“She has been”) with truth (“There she is”—again and again) while, at the same time, confirming both her life and her death: “it becomes at once evidential and exclamative; it bears the effigy to that crazy point where affect (love, compassion, grief, enthusiasm, desire) is a guarantee of Being” (Barthes, 113). In the moment of looking at a photograph, one enters this cut across knowing and feeling, and there is, for Barthes, a potential enlightenment: “a satori” (Barthes, 50, 84, 109), an act of grace (Barthes, 109), a “madness” (Barthes, 117), an “action of thought,” noesis, “without thought,” noeme (Barthes, 111). Photographs open up a transparency that lets us see the depths and dimensions of persons. The photograph itself is always invisible: it is not it that we see (Barthes, 6). What we see is a real being. For Barthes, a photograph, though not animated, animates; it generates adventure (Barthes, 21) because it is “an emanation of the referent. From a real body, which was there, proceed radiations which ultimately touch me, who am here” (Barthes, 80), like, as Susan Sontag put it, “the delayed rays of a star” (Barthes, 80-81). That is why Barthes argues that photography “has the same relation to History that the biographeme,” as minimal unit, “has to biography.” See Barthes, 91. For example, many of the photos in the text, particularly in the section Said entitles “Interiors,” bear witness to the Palestinian struggle merely to establish permanent homes, that is, homes that cannot be taken away via a new settlement, the sale of their land, home demolitions, and the like. Living this way, Said writes: “You learn a certain kind of caring for and attention to your immediate situation if you know that in time it too can become the place you will have lost forever, the place whose identity is retained only in the repeated experience of staying and then moving on. Homecoming is out of the question. You learn to transform the mechanics of loss into a constantly postponed metaphysics of return” (Said, 150). This transformation, this struggle, is the work of Palestinian life and the substance of Palestinian presence articulated in the photographs and text of After the Last Sky. The need to articulate an identity—rather than just living lives—is a function, not so much of the Jewish presence with whom they peacefully shared the land for centuries, as of the aspirations of the Zionist project and its fulfillment through the state of Israel. In the continuing wake of that project, both Israelis and Palestinians, Said says, suffer with self-understandings that are “soaked in the hostilities of our struggle” (Said, 44). Said, 61. Glenn Bowersock argues that this fragmentation has been deliberate, tearing apart a “fundamentally unified region.” This has led Palestinians to a kind of self-othering. Said recognizes that cultures “spin out a dialectic of self and other” out of which come notions of home, heroism, and enemy (Said, 40). What has happened to the Palestinian in this othering is a break in identity. Said writes: “For Palestinian culture, the odd thing is that its ‘Palestinian’ is so charged with significance for others that Palestinians cannot perceive it as intimately theirs without a simultaneous sense of its urgent importance for others as well. ‘Ours’ but not yet fully ‘ours’” (Said, 40). This is a negative image of Detweiler’s sense that I should not be able to think my story without thinking yours—one that robs the self of true self-consciousness. Azoulay is doing fascinating and important work on the civil contract of photography and takes the occupation and the resulting Palestinian predicament as a starting point. Subsequent considerations of the issues raised in this paper will have to take her work more into account. See Ariella Azoulay, The Civil Contract of Photography (Cambridge, Mass. : Zone Books, 2012) and Civil Imagination: A Political Ontology of Photography (New York: Verso, 2012). See Judith Butler, Precarious Life: The Powers of Mourning and Violence (New York: Verso, 2006) and Judith Butler and Athena Athanasiou, Dispossession: The Performative in the Political (Cambridge, Mass. : Polity, 2013). Tellingly, the focus upon daily life and the ways in which Palestinians have to produce themselves demands that any sense of identity draw upon the presence and experiences of women. Against overly masculinized political representations of Palestinians, the constant presence of women in Mohr’s photographs demand they be seen as much more than the roles they seem to have played, that of “hyphen, connective, transition, mere incident.” Women emerge as the truer representatives of the core of Palestinian life. “Unless we are able to perceive at the interior of our life the statements women make,” Said writes, “concrete, watchful, compassionate, immensely poignant, strangely invulnerable—we will never fully understand our experience of dispossession” (Said, 77). Women take on the mantle of obduracy, even against those who would speak for what it means to be Palestinian in an exclusively masculine voice. “The smile,” Said writes of the photo of one Palestinian woman, “continues in adversity, nonetheless” (Said, 104-105). Like her people in general, the woman emerges as the breaker of accepted patterns and as the source of Palestinian self-production. In Mohr’s photographs as in the woman’s work and her person, she embodies Said’s larger contention that being Palestinian means attending to the local, to the needs of the everyday, to the requirements of presence, and that these attentions “are in fact so many potential breaks in the seamless text, the unendingly unbroken narrative of U.S./Israeli power” (Said, 144). Iris Marion Young, Inclusion and Democracy (Oxford: Oxford University Press, 2002), 53ff., argues that narrative is only one form of political communication, along with greeting and rhetoric. Each form, we would argue building on her insight, narrates presence.